In this Quick Tip, we take a look at the Business of Illustrating in terms of pricing art and the need for Illustrators to be more entrepreneurial in the way they approach their self-crafted career. This isn’t easy if you don’t know how, so I’m going to tell you how right now by taking a look at some very useful pricing tips outlined by Will Terry. While browsing through Youtube, I came upon a video by Will Terry about pricing your work as an Artist and Illustrator of Children’s Books. The video runs a little long (32:47 minutes), so here is a summary of some of his points. Please note that the summary is an interpretation of his points and not verbatim. Quite often, successful illustrators and writers are barraged with questions from others who might be struggling to get into the same field. Over time, this can (as you may imagine) become draining through repetition. Will Terry, the highly successful self-employed illustrator explains that he is frequently asked about how to price your work as an Illustrator (of Children’s Books or in general). He himself works in a broad range of niches: advertisement, various renowned publications and – of course – Children’s Books. Additionally, he talks to students about his craft and art. So Will Terry decided to put his frequently given answer into the following video along with some additional information so that he could simply point people to this video tutorial on his YouTube-Channel. Terry feels that the book considered to be the trade standard on Illustration pricing, the “Graphic Artist Guild – Pricing and Ethical Guidelines,” does not really help an artist with this problem (he puts it a bit more directly, though), because a book cannot not cover all possibilities. Price is relative because the value of products and services depends on the situation and circumstances. He explains how pricing from a rigid framework (as outlined in the book) poses problems because it does not help the artist to be more flexible from one scenario to the next. Not all clients are the same, not all jobs are the same… just as not all artwork could possibly have the same value even when it comes from the same artist. The most effective way to go about coming up with a price for your work is looking at your motivation for doing an assignment. The first question most people ask is: How much money will I get for this a job? But this is like trying to start at the wrong end of a race. You should first ask this instead: Why should I actually take this assignment and what makes it worthwhile and valuable to me? Fun – this is why you became an artist in the first place… because it’s fun. Lose that, and you’ll soon feel you’d rather be digging ditches for a living. Money – how are you compensated for your work and time is always important, but it’s secondary to enjoyment. Experience – can you learn something valuable from doing this particular assignment? If you can, that is a creative perk. Service – to help someone with your work (preferably of your own accord and passion, not as a favor to someone). Any combination of these four things can motivate you taking an assignment into consideration and you should be clear about it in your own mind before making a commitment. s that in his video. You can take a look here, below. This is his own method for evaluating the amount of compensation for the work in relation to the level of enjoyment (or pain) the assignment induces. Terry gives an example of an assignment where he had a totally free hand to do an editorial for a publication and had a high desire to do the project, but only earned $100 for it – minimal compensation. However, it was worthwhile to him because he had total autonomy. The point: find a balance between the two (payment and creative perks) to decide if you are going to take an assignment. The red area shows the approximate range in which an assignment should fall for your consideration in terms of a quote. This is not a dictation, only an example to illustrate this concept. 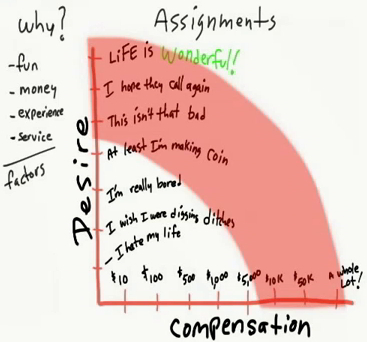 You should create your own Desire-to-Compensation Table and hang it on the wall next to your desk. Terry gives another example of an assignment: Five illustrations of people in business suites stacking boxes to signify teamwork. This for him would rate low on the desire level, somewhere between “I wish I were digging ditches” and “I’m really bored,” thus requiring a higher monetary compensation. He would think it might be worth doing the assignment for around $2000, but if he is forced to quote that price and the client actually has a higher budget, he would be doing the work too cheaply. It is understandable and smart business for the client to try to get the best price, but in turn it is also smart business for the Illustrator to probe the client’s budget. SO GET THE CLIENT TO MAKE AN OFFER FIRST before you quote a price for the proposed work. Try to get your client to throw out the first price. If that does not work, find out your own bottom-line for the project, using the above principles. NOTE: This has nothing to do with what other people say you should be getting or any standard pricing. It is your personal bottom-line, taking into consideration your personal situation (like having to make rent), your motivation to do the job and the details of the job. The bottom-line is the price where you would be OK, maybe actually happy to lose the job should you be offered a lower price (or even a slightly lower price) than what you want. Your first asking price should be about double your bottom-line, depending on the height of the total price of the project. So if your bottom-line in the above example is $2000, you should ask for $4000 with the option to negotiate down to your bottom-line (in this case, $2000). There is no surefire way to exhaust the full budget of a client, but if you ask double the absolute minimum price you need to make the project worth your while, you should be all right in any scenario. A last tip from Terry is that you should let it be understood that you are pretty swamped with work but you really would like to take the job. Ask if they can stretch the deadline for the project. This drives up your value in the eyes of the client and they might be willing to pay you more to finish on their schedule. In closing Will Terry says that as an Artist you have to become a businessman (or woman) today and learn how to sell yourself and your art most effectively. This Will Terry video gives interesting insights into the business of Illustration. Especially the pricing examples are quite valuable – in particular to a beginning Illustrator just embarking on establishing their career. The tactics described are all valid and useful. The model Will Terry proposes gives a good guideline to figuring out a price for your work. This type of business negotiation is nothing new or revolutionary, but it may well be foreign territory to an artist. When dealing with corporations and businesses, this is how business deals are done. Learning to conduct your own business in the same way is what will enable you as a creative person to earn a living you can actually live on. There is no need to fulfill the starving artist stereotype. Over the next several months we will be creating a series of posts on the business and marketing side of Writing and Illustrating Children’s Books, as well as posting more interesting and helpful videos by established people in the industry. Terry is right: in today’s highly competitive world you have to be a bit of an entrepreneur and to do that you must develop marketing skills. Hopefully we can help you with that. The Pricing Table is both innovative and helpful. I particularly appreciate the inclusion of “service” as fundamental to Why.